Staff Selection Commission invited applications for SSC CHSL Exam 2016 at ssc.nic.in under which 3281 applications are invited for Postal Assistant/Sorting Assistant Posts. The CHSL Exam 2016 is no long way and will be conducted on 07 January 2017. Staff Selection Commission invited applications for SSC CHSL Exam 2016 at ssc.nic.in under which 3281 applications are invited for Postal Assistant/Sorting Assistant Posts. The vacancy is huge in number and a golden opportunity for candidates willing to apply for the post. The CHSL Exam 2016 is no long way and will be conducted on 07 January 2017 for which the candidates must now fasten their belts. SSC conducts Combined Higher Secondary Level Examination (CHSL) every year to recruit candidates in the posts of Assistant/ Sorting Assistant, Lower Division Clerk, Data Entry Operator and Court Clerk. 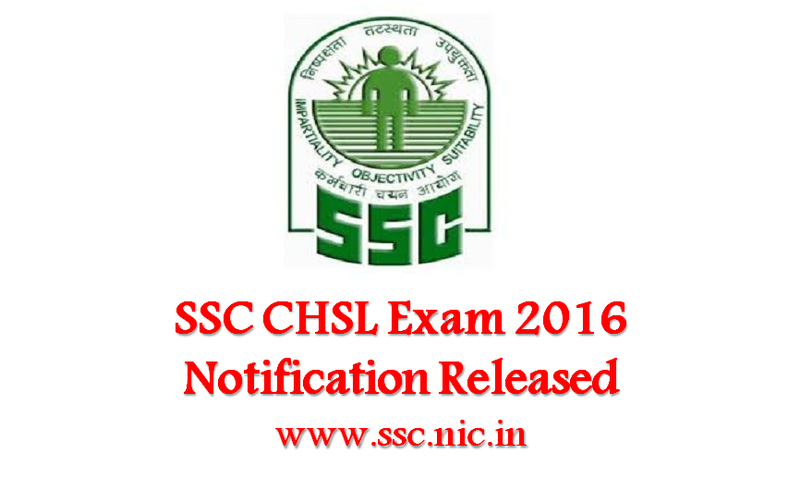 This year too the online applications for SSC CHSL Exam 2016 were invited till 07 November 2016 from 12th pass candidates. The CHSL Exam 2016 is scheduled to be conducted by SSC on 07 January 2017 for 5134 posts out of which 3281 posts are vacant for Postal Assistant/Sorting Assistant, attaining the maximum vacancy number. The SSC CHSL 2016 Exam is set in three patterns i.e., TIER I, TIER II and TIER III. TIER I Exam is Computer Based Objective Type of 200 marks whereas, TIER II exam consists of Descriptive Paper of 100 marks, Candidates who will qualify TIER I and TIER II Exam will be followed by TIER III Exam which has Skill Test/ Typing Test. All those candidates who have applied for CHSL 2016 should now have the utmost energy level to prepare for their exams. SSC will conduct the CHSL Exam TIER I for 75 minutes therefore, the candidates must gear up with their questions solving speed also. To get more info regarding SSC CHSL 2016, click on the link below. Previous Article Railways Jobs: Apply for 4356 Vacancies of Trainee, Maintainer, Software Engineer, Assistant, etc.